Today we’re going to talk about donor psychology. Specifically, I’m going to share 15 psychological triggers I learned through research and practice that get people to donate. When you dive into the study of how people behave and what moves them to give, your eyes will open to the possibilities. You’ll learn to write better appeals. You’ll discover how to present your organization’s brand in a way that converts donors. We’re not going to discuss anything unethical today, but instead we’ll explore why people behave a certain way, and mistakes you make be assuming work don’t actually contribute to someone making a positive decision to donate. I’m very excited to bring you today’s episode of Non-Profit Answers. Recently my 15-year-old daughter Emily showed interest in fundraising, so I decided to do a multi-part series teaching her fundraising, teaching from the perspective of what she would need to know if this was a profession she wanted to go into. I know you’re going to get a lot out of this second episode in the series. 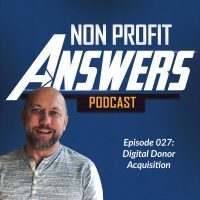 In the previous episode, we talked about donor motivations, specifically about motivations a donor could have to donate to your organization. I encourage you to go and listen to that first episode in this podcast series, even if you’ve been a fundraiser for some years, I believe you will learn the external and internal motivations for why people give. The motivations you learned about in the previous episode, and the psychological triggers you learn about in this episode speak to the motivation for why someone donates. We’re also going to explore the best fundraising techniques for each of these psychological triggers. I know it’s a fascinating topic, and I know you’re going to love it as much as I loved researching and putting together this episode. Now, a lot of fundraisers including myself have preached that people respond to fundraising from an emotional perspective. They have an emotional response to giving money, but what is the deeper motivation for giving? Why do people respond to certain types of appeals, and not to others? Why does it seem that logic and facts are a secondary motivator in a story of a child or other beneficiary moves people? It’s a little research that explains the internal motivations for why people give, and there’s known triggers that elicit a certain response from people. In this podcast episode, I’ve combined research from donor motivation psychology, influence psychology and sales psychology to identfy and epxlain 15 different triggers that move someone to action. I’m not an expert in donor psychology, so I’ve written a number of papers and books by people far smarter than I am. One of the best books you can read is called The Influential Fundraiser. It’s by Bernard Ross and Clare Segal. Also the two books by Robert Cialdini, Influence and Persuasion, are excellent books at understanding the motivations for why people do certain things, and the psychological triggers that cause them to take certain actions. On today’s episode, we’re going to explore the first eight psychological triggers. In the next episode, we’ll explore the remaining seven psychological triggers. First, people make emotional decisions and then back them up with facts. It’s not that people don’t care about the facts that you’re presenting to them. What matters most to them are the emotions that they feel that convert them to become a donor. When you’re writing an appeal, if you tell them about the thousands of people that this appeal is for, that the reader will help, they’re not going to be able to relate as much as they could if the person was a single child. You see, when I help one, I’m helping all the other kids that are just like him, so when you tell the story of the one, the story of that one child that I’m able to help, that one homeless vet that I’m able to help, then I’m able to extrapolate to see how far my dollar goes when you mention later in the appeal the number of people that will be impacted from this program. Remember, most people make decisions based on emotions when they give. They don’t make decisions solely based on facts. Most donors give because of emotions, and then reinforce their decision with the facts or logic that you present. It’s not that facts aren’t important, though. There are a small percentage of donors who do make decisions based on facts. Many of these donors are what we would call major donors, or those donors who have an ability to give a lot of money to causes they believe in. Many major donors rely on the facts to make the decision, but the emotional appeal is what grabs them. In fundraising, you need to tell the story of the one, the story of the one person that will benefit from the donation. This story allows the reader to connect with a single person and drives the emotional response. You back up that story of the one with the facts about what you will accomplish with the donation, and how trustworthy your organization is. By starting with the story, you capture the emotional side of the donor and then you use facts to build the case, and confirm that the donation decision is the right one. The second psychological trigger: people have egos. People want to know what’s in it for me. When they donate, they want to know what are they getting in exchange for their donation. For many people, just helping other people is that exchange, that feeling of joy that made a difference with their donation. People want to know that when they donate, that they’re making an impact. When you present your fundraising appeal, you want to ensure you explain in detail the impact that their donation is going to have, and after they give, you want to tell them the impact that they made. People want to feel gratitude. They want to know that you appreciate their gift, that you appreciate them donating to your organization. For some people, recognition helps reinforce their decision, and for lack of a better phrase, it feeds their ego. This could be as simple as recognizing a donor in the newsletter, annual report, in social media. You want to make sure that you get permission before publicly recognizing donors, as some won’t appreciate the gesture, and they want to remain anonymous. Third, people fear losses more than they seek gains. People don’t want to lose out on something. For example, people feel it’s better than to lose $5 than it is to find $5. This psychological principle applies as you present an appeal of a beneficiary. The story should contain elements of loss, and specifically highlight the pain point the donor is solving. When you demonstrate the loss instead of focusing on the gain the beneficiary will receive, the donor is more likely to respond because he can feel the loss in the story, and know the pain point he’s trying to solve. When you show a donor what pain point he is solving, and trigger the donor to emotionally connect to the story, he will donate to help the beneficiary avoid the loss. Fourth, people are naturally suspicious. They ask the question: Can I trust this non-profit? Will they do what they say? There are three things that you can do to solve the psychological trigger. First, demonstrate success of other donors like him. In your copy, show that a donor that gave a donation, that that donation had an impact. We call this social proof. When someone provides a quote telling the reader the non-profit is trustworthy, it helps build up proof that the reader can trust you. Second, build a relationship to grow trust with the donor. Relationships take time to build. You’re not going to do it with one appeal. You can build trust with a donor through impact reporting and email and social media, through phone calls, handwritten thank you notes, conference calls with your leaders, positive press. Third, tell more stories. Stories are the life blood of every non-profit organization. Telling stories builds trust with donors because she will be constantly reminded what good work your organization is doing. Tell vivid stories of beneficiaries who are impacted. Tell stories of donors whose lives were changed by supporting your organization. People love stories, and they hear more stories about your organization, then they’re going to grow to like and trust your organization. The psychological trigger is that people respond to visual elements and stories. People will tell you that they give because of logic or facts, but they’re wrong. They want to hear the stories. People give because they connect with other human beings, not with statistics. You want to show these stories with images and videos when possible. Stories build a foundation of trust between you and your reader. When you have pictures or videos that show the success that you have as an organization, you help people see the work that they’ll support. When someone can see the work, it creates a connection for people who like to connect visually. You want to make sure that images align with your story. I’ve got a funny story about this one. Several months ago, there was a story that came across my desk. This was before it went out to print, and was in the review phase. The story was about a family that didn’t have anything. There was a famine, it was arid conditions, there was a crop failure. The picture that was associated with the story in this appeal was a young man, if you can picture this with me, he was kneeling in his garden holding this beautiful head of lettuce with a beautiful green garden behind him. So though that picture was taken after the problem was solved, it didn’t align with the story that was contained in the appeal. You want to make sure that your images align, or your videos align, with the story so there’s a good connection between what the donor is reading and what you’re saying that you’re going to do with that donation. We call that congruity in the non-profit world. Six, people want value. They want to know that you’re a good place for the donor to invest in. For this psychological trigger, you want to tell them of the beneficiaries’ needs, not your own organization’s needs. When your organization tells bout their needs, let’s say you say in an appeal, we’re $50,000 short this month, we need your donation to keep the lights on. The donor begins to wonder whether or not they can trust you with their donation. People don’t want to donate to an organization that’s failing. They don’t want to donate to an organization that’s going down. You want to tell the needs of your beneficiaries, and how that money will be used to impact those beneficiaries. Showing how the donation will be used to help beneficiaries will motivate a donation. Telling stories of how your organization needs the money to pay salaries and expenses, that’s a guaranteed formula for a poor fundraising response. Seven, people are influenced by crowds. People are swayed by what their peers are doing. In this case, social proof is very important. As I described earlier, social proof, they are the testimonials from real donors that your work is worth investing in. Having social proof in your appeals or landing pages helps convert someone from a reader to becoming a donor. They see other people who have given and provide testimonials, and they feel like they could trust your organization because they see other people that have given and have trusted your organization with their dollars. Peer-to-peer fundraising is a powerful way for people that are influenced by crowds. As someone sees their friends giving, they’re more motivated to give themselves. Finally, you can also use crowdfunding in the same way. When a number of people are giving, that becomes the social proof that your organization is trustworthy because all these other people trust the organization, and they trust a particular campaign that they’re giving to. The eighth psychological trigger: people are moved by a feeling of reciprocity. If you show up at Costco, you may end up buying something because of reciprocity. You may see a free sample of pizza. You feel like, you know, after you taste that pizza, well, I need to go buy that pizza because I tried out a sample. It’s also why people send money when they receive front end premiums like address labels or stickers. People give because of this feeling of reciprocity. They feel like they must give a donation since they received something. There are other ways other than these front end premiums to move people that are moved by this feeling of reciprocity. You can use contents of e-books, quizzes, music downloads from an artist that you’re associated with. These types of premiums are an inexpensive way to move someone to donate. There’s a simple reason why this works. The goal is to have the potential donor receive multiple small items, so that when the appeal comes, they respond to the ask because of this feeling of reciprocity. So they feel like because they’ve gotten these small items, that they’ve made these micro decisions to say yes, that when you ask for a bigger decision, then they feel like they need to say yes. Thanks for joining me for these first eight psychological triggers lesson on this podcast. In the next episode, we’re going to go through the remaining seven, so you’re going to learn a total of 15 different psychological triggers that really help move people from that decision of reading your appeal to actually making the donation.